Experts believe a lack of oxygen caused thousands of dead menhaden to wash up on a South Carolina shore. WMBF's Ken Baker reports. Thousands of dead fish washed up on a mile and a half stretch of beach in South Carolina Tuesday, officials said, at least the second such occurrence in the region in a week. Roughly 30,000 to 40,000 menhaden fish, 6 to 8 inches long, were spread along the shore from DeBordieu Beach in Georgetown County, S.C., to Pawleys Island, a town on the state's Atlantic Coast, and thousands more were expected, Pawleys Island Police Chief Michael Fanning said. Similar incidents have happened in the area before, including late last week when hundreds of thousands of the small, oily fish were washed ashore near Masonboro Island, N.C., and last year when an influx of dead starfish were found on the same beaches. The fish were first spotted by beachgoers taking advantage of the unseasonably warm weather. "We came down to the beach for the day just to have, you know, a nice day on the beach, smell the fish smell, came down to look for shells and all these fish -- dead," Pawleys Island resident Pat Hawkins told NBC station WMBF in Myrtle Beach, S.C. "It's a shame. I don't know what's causing it." Officials from the Department of Health and Environmental Control and the Department of Natural Resources visited the area Tuesday and took water samples in an effort to determine what killed the fish. Marine experts determined the fish died from hypoxia, which occurs when the amount of oxygen in the water drops. 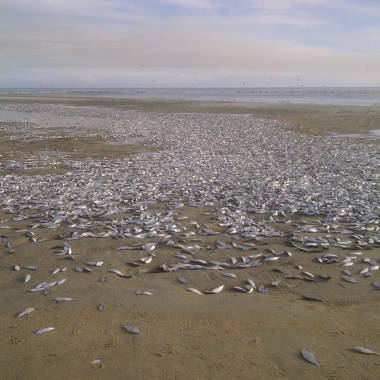 Thousands of dead fish washed up on a Pawleys Island, S.C., beach Tuesday afternoon. Mel Bell, director of the Office of Fisheries Management for the South Carolina Department of Natural Resources, said the occurrence was an entirely natural event. "When it's one species like that, that's usually indicative of a low dissolved oxygen situation because they tend to be more fragile," added Dan Hitchcock, an assistant professor at the Baruch Institute of Coastal Ecology and Forest Science at Clemson University in Georgetown, S.C.
Fanning said the city has no plans to clean up the fish and will let the seagulls and the tide clear the sand. Menhaden fish, typically used by fishermen as bait, are a small, silver fish, whose oil is used in vitamin supplements, lipstick and livestock feed.